Next time you're on the road, pass the time and get your creativity flowing with this cool, travel-sized Tegu Magnetic Building Blocks Pocket Pouch. With a satisfying clack of wood and magnets, the blocks stick together to form anything from abstract art to a myriad of geometrically-defined animals. Choose from a traditional set with blocks and flat rectangles or a set with triangles and parallelograms -- both come in natural wood tones or fun color combinations. Create away! The perfect toy for building on-the-go! 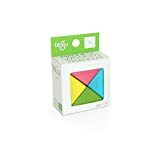 Fully Compatible with ALL other Tegu Magnetic Wooden Sets.